MSDS Software – Created by Hibiscus Plc as a joint development with Lexeus Ltd. Created by Hibiscus Plc, as a joint development with Lexeus Ltd, Prometheus is our simple, intuitive, flexible and cost-effective solution to the problem of creating, storing and distributing your safety data sheets. Its WYSIWYG (What You See Is What You Get) style interface makes creating Data Sheets as simple as filling in boxes by picking phrases from a list. Prometheus can be used independently as your ideal SDS creation and distribution solution, or integrated with our companion products to solve all your hazardous chemical documentation and labelling needs. Prometheus is designed to interface directly with Label Enterprise to form an integrated solution to your SDS and labelling requirements without the need for dual entry of data – ie., once you have created your SDS, all the information required for your hazardous chemical labels is already there and can be accessed quickly and easily from your labelling database. Prometheus also links to Harmoneus2, our chemical classification software. Designed for flexibility and ease of use (and now including our new Poison Centre XML export feature), Prometheus MSDS Software, allows you to create templates describing the basic layout of your SDS’s, including different layouts for different markets/customers, and to build up your SDS’s on screen by filling in the appropriate elements – in most cases by picking standard phrases from a pre-installed list. More information for Prometheus is available at Lexeus. Prometheus can be supplied with SDS phrases in a comprehensive set of European and selection of other languages. Once an SDS has been created in English it can be converted to any other available language at the click of a button. Prometheus SDS Management Software can print your data sheets directly, or write them to pdf files, in your preferred fonts and layouts. As well as creating data sheets in different languages, Prometheus allows you to create and maintain data sheets that are different for different territories. For example, you may wish to include or exclude certain data in a French SDS for France, but not for French-speaking Canada, or you may want to use different supplier addresses and logos for different subsidiaries. 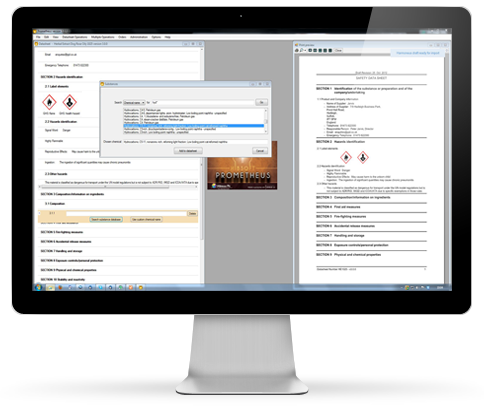 Prometheus MSDS software uses templates to customise the appearance of safety data sheets (including embedded logos) to suit clients and destinations (ie. where different customers or regions may impose different requirements). For example, you can replace the graphics for hazard symbols etc with your own; you can specify the font and font size to be used for each language separately; and you can print logos, and groups of logos, in a variety of locations. Once you have created your SDS, you can output it in any or all of the created formats. Prometheus saves you time and effort by storing vital information in a database from where it can be quickly and easily retrieved to use in a new data sheet. For example, you can set up a database of constituents that you use in more than one product so that you do not need to re-enter the details about them each time you create a SDS. Automated functions for conversion between languages and territories allow you to develop and maintain sets of SDS from a single master and to create and export pdf files of all of them with one button click. As well as producing your data sheets, Prometheus can pass the relevant labelling information directly into HibSoft Label Enterprise to immediately begin producing your chemical hazard labels with little or no additional effort (and provide an all-in-one solution for your data sheet and labelling needs). 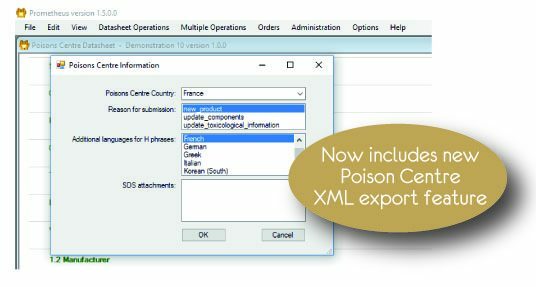 Prometheus is the only Safety Data Sheet software to offer our new Poison Centre XML export feature. Datasheet-like documents can be prepared and written to XML files conforming to the format specified for delivery in EU countries. Access to Prometheus is password controlled and you can set different access levels for different users allowing you to maintain precise control over who can make changes to your data sheets and/or approve final versions. You can also put the Prometheus database on a file server on a computer network, allowing different users to access the one version. Once you have approved a data sheet it is protected from further changes. If you seek to edit it, Prometheus will offer to create a new version. While the new version remains as a draft, only the approved version is available for despatch to customers. When you approve the draft version, it becomes the new current version but the old one is retained as an archive, keeping a continual audit of what changes have been made and by whom. Prometheus can cover major global compliance regulations and can also accommodate requirements for specific legislation, such as the German environmental Water Hazard Classification. MSDS data can also be received directly from Lexeus Harmoneus classification software, enabling SDSs to be created automatically as part of the classification process. Prometheus can then despatch your data sheets as pdf files directly to your email outbox, attached to covering email messages, for delivery to your customers. You can also export the pdf files automatically to the directory you use to support your website or a company document management system.